A dinner at Dusek’s in Chicago introduced me to Dry Roasted Mussels. The recipe here is inspired by theirs and the smoky finger lickin’ good flavor I remember from that killer meal. Smoked Paprika is a must–I used Hot Spanish Smoked Paprika to add to the bold flavor that sticks to your fingers and the shells. This is a quick recipe for impressive dinner food that requires minimum preparation. Serve with a cold bottle of white wine, some crusty bread, and napkins for your soon to be spicy fingers and enjoy! Two types of paprika and other herbs. Go heavy, this is a dish bursting with flavor! Wash well and let your shells dry before cooking. The herb mixture will need to stick. 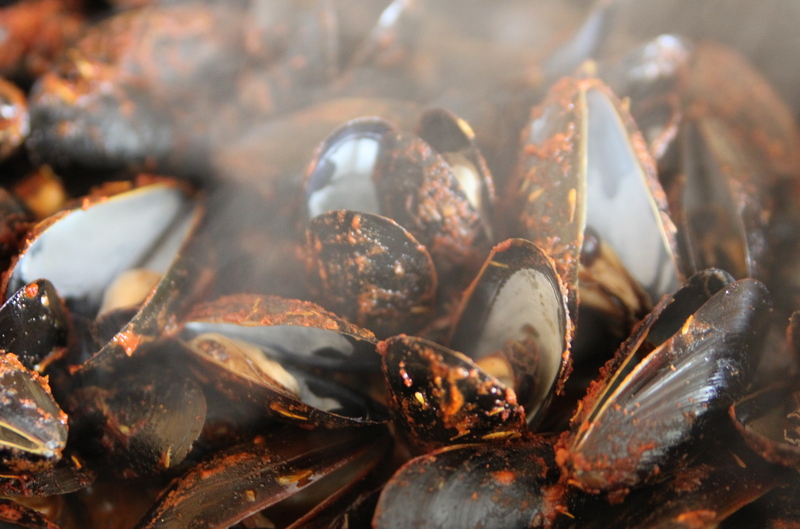 Your pan should be smoking hot: hot enough for the smoke to continue through the mussels at all times. Mussels opened once properly cooked. Top with cilantro for some added freshness. Lick those shells, they are flavor bombs. A great dinner for two or an appetizer for a dinner party to be shared. Harissa Butter for indulgent dipping. Quality crusty bread is a must. 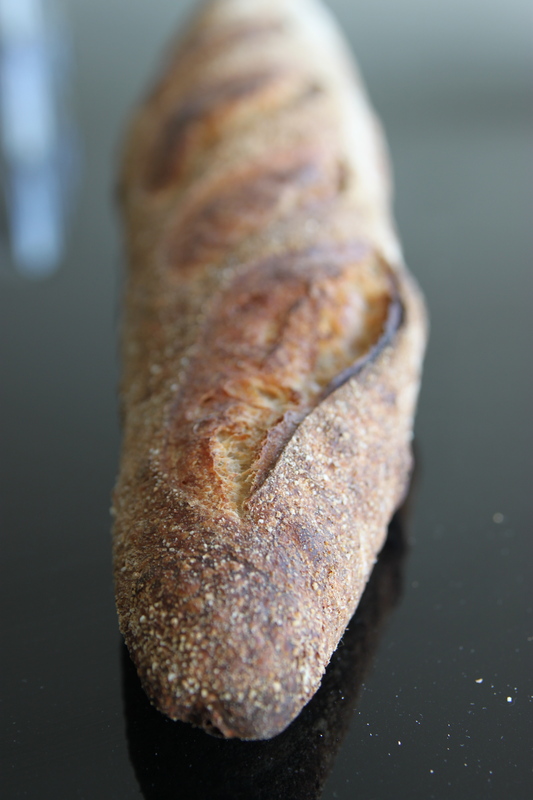 This baguette is from Milo & Olive in Los Angeles. 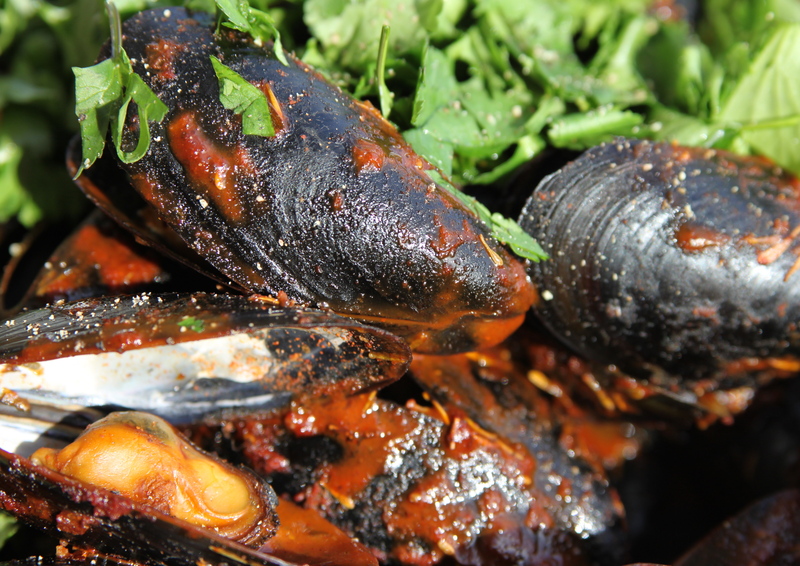 1) Wash mussels well and scrub away any debris attached to them. Discard any mussels that do not close as they are not alive. Rinse well with cold tap water and place in a colander to the side. Do not let them sit in water. 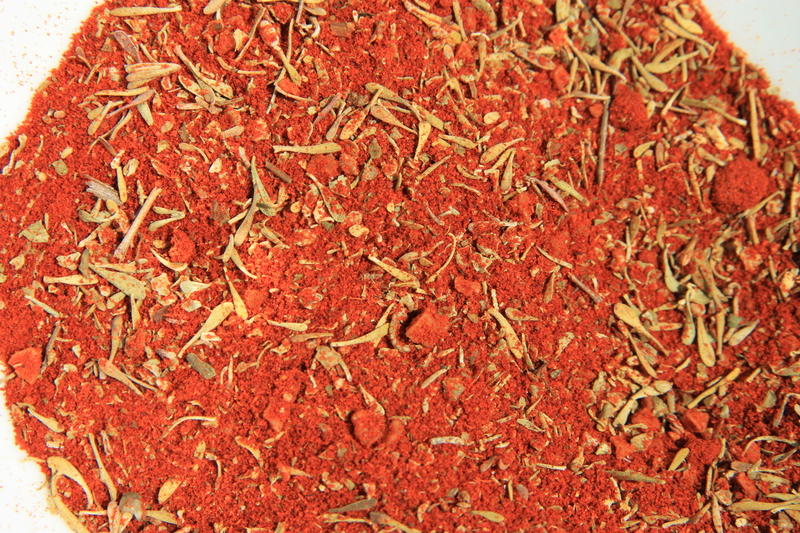 2) In a small bowl, mix Paprika x 2, Thyme, Marjoram and Sea Salt with a fork to make a uniform spice mixture. Place to the side. 3) Place a well seasoned Cast Iron Pan on the stovetop and turn heat to medium-high. Let heat for at least 5 minutes, until the pan is smoking and uniformly hot. 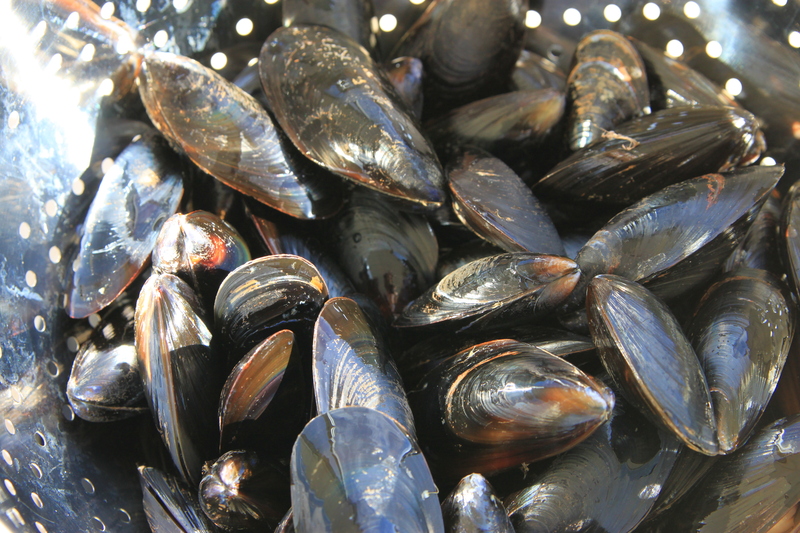 4) Once mussels are dry, place them in a large mixing bowl. 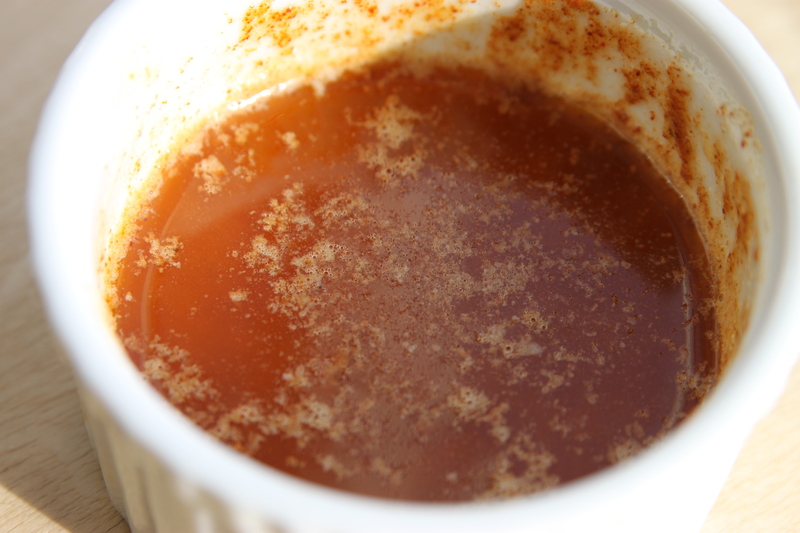 Then, top with the spice mixture and 2 Tbsp. of olive oil. Mix and shake well using your hands to cover all shells with the spice mixture. You do not want to leave any of the spices behind. 5) Chop fresh cilantro for later topping the mussels. Using a small pan, heat butter over low heat till it is completely melted. Then, add dried Harissa and stir cooking over low heat for four minutes. Place Harissa Butter in a ramekin for serving. 6) Quickly drop the mussels into the piping hot cast iron pan. Then, top with a splash of wine. 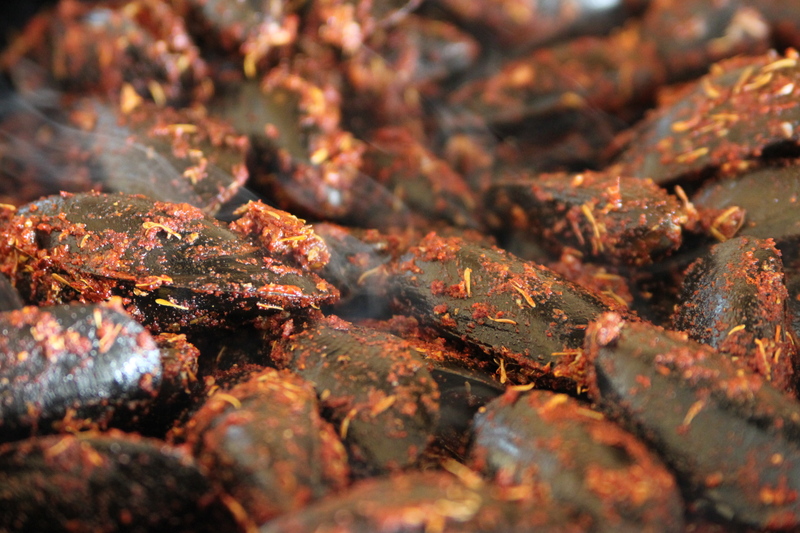 You just need a splash as these mussels are not steaming or boiling like conventional cooking. Instead, the hot pan will do all the work. Stir vigorously, then cover the pan with aluminum foil to keep some moisture in the pan and cook via shaking the pan around and stirring occasionally. Total cooking time in pan is approximately 6 minutes. Once your mussels have opened remove them from pan and place in a serving dish. 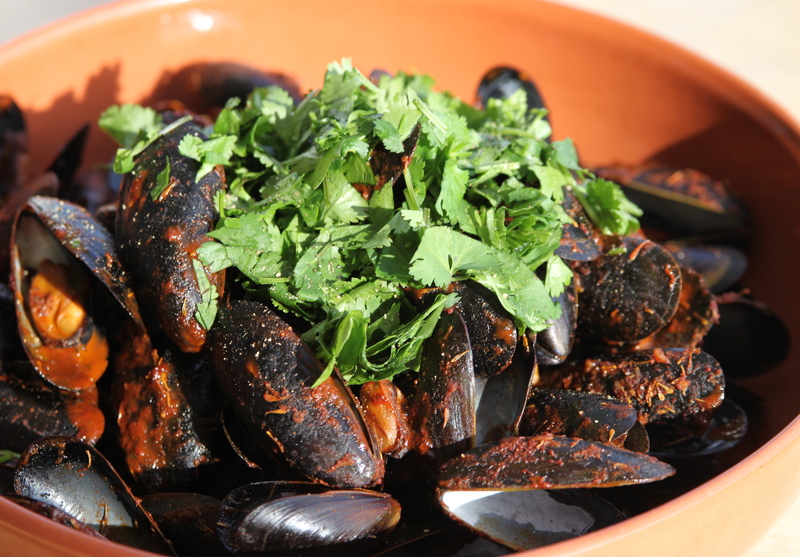 7) Top the mussels with fresh cilantro and a bit of freshly cracked pepper. 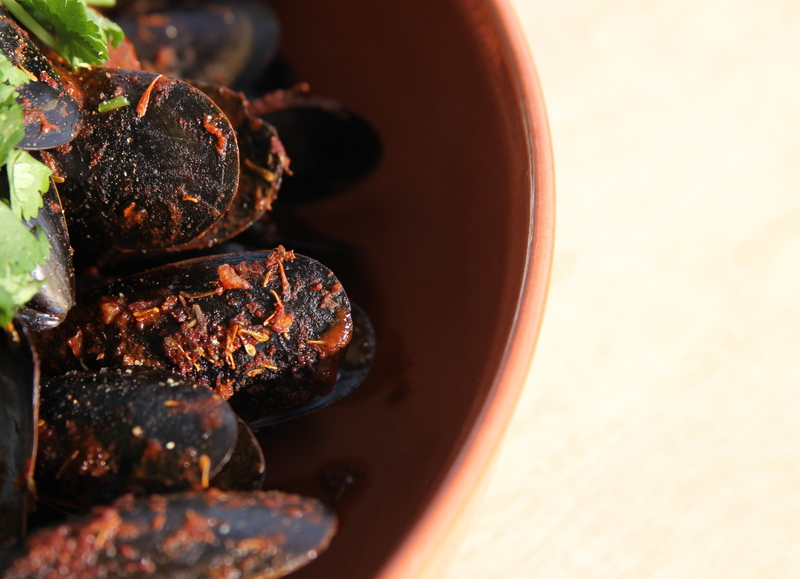 Dip mussels in Harissa Butter and serve with crusty bread. Enjoy!